Begun in 1909, the Nevada Copper Belt Railroad's primary purpose was to transport copper ore from the mines at Ludwig to the Nevada-Douglas smelter at Thompson, near Wabuska. In addition, the 38-mile road handled agricultural products of the fertile Mason Valley region and, of course, the general passenger, light freight, mail, express and merchandise. The road was completed in October of 1911. Since the NCB was dependent on the market value of copper, its fortunes often suffered because of the extremes encountered in the marketplace. Substantial profits between 1925 and 1930 funded a number of capital expenditures, including the purchase of a secondhand caboose from the General Equipment Company of Lima, Ohio for $1850 in 1928. The origin of the caboose was long obscured until restoration when the tin roof panels were removed to reveal a shipping address for same to the Hocking Valley Railway at Logan, Ohio. Further research indicated that quite possibly this car was built about 1906-07 by the railroad, which was absorbed later into the Chesapeake & Ohio system. NCB combination caboose and baggage car No. 3 carried passengers in mixed steam train service between Mason and Wabuska. Following 19 years of service and the abandonment of the Nevada Copper Belt, the 33-foot long car was sold to the Virginia & Truckee Railroad and assigned No. 24. Its acquisition in 1947 provided an opportunity for V&T passengers to ride in the cupola, or "vista-dome" section of the caboose. Sporting a bright yellow coat of paint, V&T caboose No. 24 enjoyed intermittent use on the Reno to Minden run. Upon the end of service in 1950, the car was purchased by the Nevada Day Committee for display in Carson City. Thereafter, the Committee, as well as the city&apos;s Chamber of Commerce utilized the caboose as their headquarters in front of today's Nevada State Library. It later became a small walk-through tourist museum. In 1982, the Chamber agreed to loan the caboose to the Railroad Museum for indoor public display and restoration. Formal gift of the car was accomplished in 1987. The 60 year-old veteran of two well-known Nevada short lines was moved into the restoration for rebuilding. 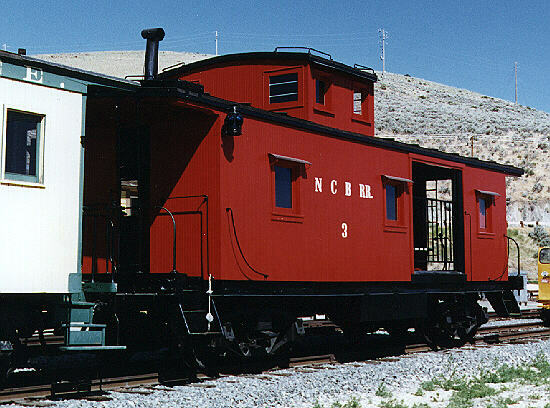 Nearly a year later, the distinctive wooden side door and cupola caboose -- a vanishing breed of railroad car -- made its appearance on Nevada Day, 1988 as Nevada Copper Belt No. 3 (1938 appearance).